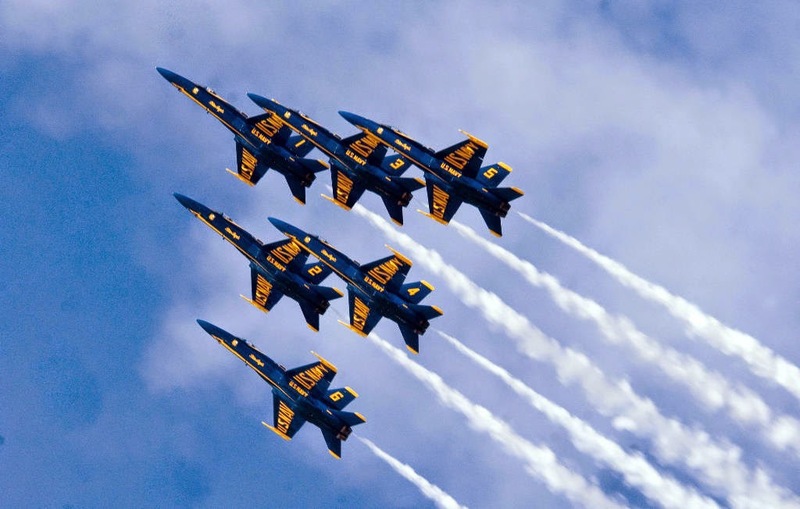 The exhilarating and popular Navy Blue Angels, based at NAS Pensacola, and can be seen practicing over the Museum most Tuesday and Wednesday mornings from March to November. Practices typically begin at 11:30 a.m., and generally last about an hour. Admission is FREE and open to the public. The outside viewing area is located on the Museum Flight Line north of the Museum. Directional signs are posted to help visitors locate the viewing and parking locations, including limited parking for handicapped visitors. Bleachers are available for seating 1,000 people. Feel free to bring your own lawn chairs. We also suggest that visitors bring hats and sunscreen; additionally, hearing protection is recommended for those people with sensitive hearing. The U.S. Navy Blue Angels often defy physics with spectacular aerial feats but, when they are on the ground, they always take time to meet and greet their large fan-base from all age groups. On most practice Wednesdays, the Blues make themselves available for autographs inside the Blue Angels Atrium at the National Naval Aviation Museum, and also sign autographs following most Saturday and Sunday air show performances across the country. Don't miss a chance to see the show live and in person!